2006 was a year that changed my life. 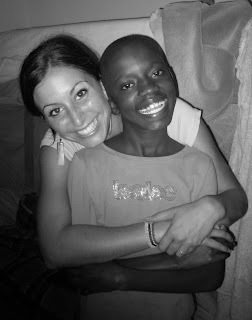 Among those changes was falling in love with a group of 7 orphans in Kampala, Uganda. There are thousands of kids who need love in Uganda, but you cannot really choose whom you love or understand why God brings certain ones to you. When I met them, they were basically a child headed household. 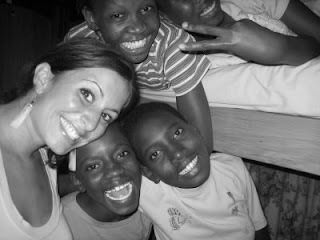 Seven orphans as a result of war in Kenya years ago. An American missionary found them all as babies, many of them she nursed back to health, and most of them were close to dying when she took them in. When she moved to kampala she brought them with her, so now they live in a small house but they have no family or friends here. The woman is nearing 70 and she works 3 jobs in the states to support them and put them through school. She does the best she can, but there are always more needs. The greatest is that they need someone to love and mother them on a consistent basis. Since I've known them they've gone through 5 caretakers and none of them loves them like a mother would. Every time I am back in Uganda I bring clothes and things for them and stay with them and love on them, but it isn't enough. They really are special children---they love Jesus and are so smart and I just feel there is a real purpose and call on their lives, that I need to nurture. This last time I found them in the house and they had completely run out of food and were about to be evicted from their home on the 15th of this month. God's timing really is perfect. I had to pay and speak with the landlord because it was a desperate situation. Because of the fact that they are Kenyan, most Ugandans here will not help them so they would most likely be on the streets. They really only have each other. I have written about them here on my blog in the past and posted pictures, especially of little Mary, who is the baby, and is really attached to me. She says she doesn't care if she has to switch schools as long as she can be with me. She says she'll move to Gulu. Of course it just breaks my heart because I would so love to have them all with me. Mary drew me a picture of her and I holding hands and she wrote: "I dreamt when you came you told me to pack my bags because I was going to America with you to be a singer. I was so surprised and happy but when I woke up I got sad because it was just a dream. But I know some dreams can come true. So I trust God and I be waiting for you." Heidi Baker always says be the good news--whatever that is to someone...for Mary, being the good news is being with me. For all of them, its being with me and just being loved. That's all they want. So I'm praying about how I can be the good news to them. So pray for ways that we might be able to support them. Their housing alone is over $150 a month and that's not including school fees. And they were almost evicted because they are 1.3 million shillings in debt...which is around $900. We need to pay that off so they can stay at that house....even if I move them, it must be paid or the police will come after them. So pray for God's provision. I also did a special project with my elementary school where I was teaching where the kids all wrote letters and sent some special items over to the kids, and the kids just loved it and wrote them back. It was really precious. So any special notes or drawings you'd like to send can be sent to the same address above. Their names are Samuel, Timothy, Samson, Grace, Rachel, Sara and Mary. Be praying for us.